We are the only university where a world-renowned design college, a rigorous liberal arts college, an exceptional performing arts college, and many legendary graduate colleges and programs come together. Our 10,000 students study across our colleges, breaking down walls between disciplines with the goal of designing a better, more just world. Learn more about the colleges that make up our progressive university. From the moment you enter Parsons, consistently ranked one of the top design schools in the world, your conception of design will be challenged and expanded. While here, you’ll learn to apply new perspectives and critical thinking while mastering established fields of design or advancing emerging ones. 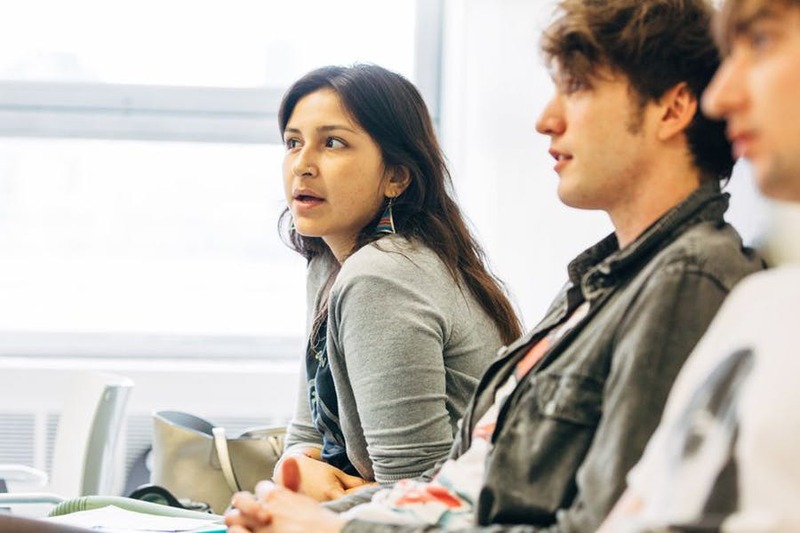 Designed for fiercely independent scholars, our progressive liberal arts college is where immersive intellectual exploration meets real autonomy. The reading- and writing-intensive programs at Lang are grounded in scholarly development and deep critical thinking. With a flexible and diverse curriculum, you have the freedom to explore exactly what is relevant to you and find your own academic path. Emerge from the university as a 21st-century artist. The College of Performing arts is made up of three renowned colleges: the School of Jazz, Mannes School of Music, and the School of Drama. While here, you can expand the outermost limit of your artistry, taking advantage of the opportunity to draw on different artistic disciplines. Alongside prominent faculty, you will reinvent tradition, engage with social issues, and develop entrepreneurial skills to pursue sustainable career opportunities after graduation. The New School for Social Research has a legendary history, upholding the university’s longtime tradition of challenging orthodoxy, promoting public debate, and cultivating academic rigor. Studying and working alongside prominent faculty, you will develop new perspectives and bring new ideas into the world in the areas of social sciences, philosophy, and historical inquiry. Our graduate, professional, and adult bachelor's programs connect theory to real-world practice, training you to address civic life, create new forms of culture, and respond to contemporary challenges around the world. Whether you're studying at Milano School of Policy, Management, and Environment; the School of Media Studies; the Julien J. Studley Graduate Programs in International Affairs, the Creative Writing Program; or the TESOL program, you can pursue your academic, professional, and civic aspirations, studying and working alongside a network of professionals. Imagine living and studying in the heart of Paris. Imagine an intimate, atelier-like environment in which to study classical artistic traditions, explore new creative methods, and develop convention-defying designs. At Parsons Paris, guided by Parsons’ signature curriculum, you will work side by side with undergraduate and graduate students from around the world. Discover how Paris’ unique features—its heritage brands, place at the center of European industry, new technologies, and social innovation—can enrich your work and relevance as a global designer.